Monte Carlo simulations are invaluable for anticipating future throughput in Lean project management. Learn how they work and why should you use them. Work estimation has always been a problem in project management. To be more specific, the real pain is making a precise and realistic forecast of when you are going to finish the project and deliver value to your stakeholders. Trying to solve this problem, managers have turned their gaze towards statistics in order to make data-driven forecasts. Very few tools can give you more certainty when anticipating future outcome than the Monte Carlo simulation. In Lean management, where continuous improvement is the driving philosophy, making realistic forecasts can be a daunting task. In order to challenge your team and yet commit to a reasonable deadline, you need to rely on data as much as experience. The Monte Carlo simulation is a mathematical technique that allows you to account for risk and help you make data-driven decisions. It is based on historical data that is ran through a large number of random simulations to project the probable outcome of future projects under similar circumstances. Since the simulation was introduced in the middle of the 20th century, it has proven to be a very realistic way of presenting the probability of future events without shooting in the dark. Logically, the Monte Carlo simulations have found their way to Lean management. They are a “must have” feature in professional software solutions for applying the methodology. With their help, you can make probabilistic forecasts about one of the key performance indicators in Lean – throughput. How Many Tasks Can We Finish in X Number of Days? When using the Monte Carlo simulation to forecast how many cards your team can finish in an X number of days, you just need to select a past time frame and get the throughput data for the period. The simulation will use a statistical equation that takes the throughput of a random day in the predefined past time frame and simulate several options of how many work items the team is likely to get done on a random day in the future. For example, you can take the throughput data of your team’s Kanban board for the last month (e.g. April) and make a probabilistic forecast on how many tasks they will be able to finish in May. Let’s say that on April 2nd, your team had a throughput of 20 tasks. The simulation will take this data and assume that this is how many assignments they will finish on May 15th. To project the probable throughput of May 29th, the Monte Carlo Simulation will take the throughput of another random day in April. This process needs to be repeated at least a thousand times in order to get a statistically believable prognosis. To make it more believable, most of the tools allow you to run the simulation up to 100K times. 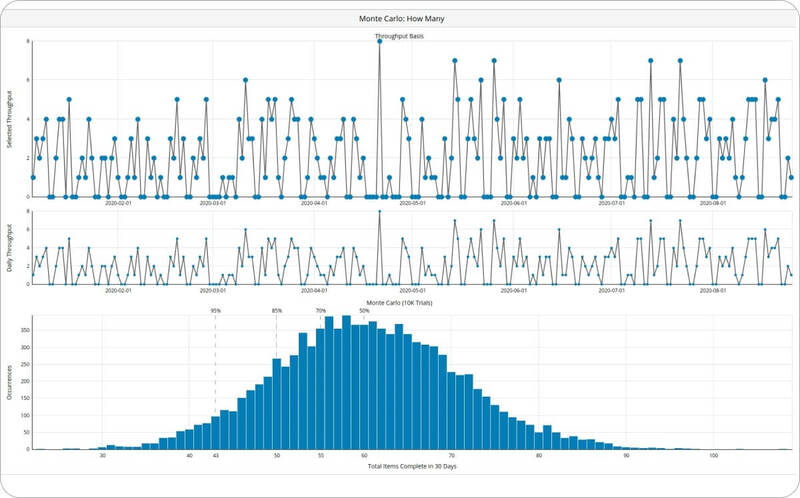 The most convenient way to visualize the results of a Monte Carlo simulation for Lean management is in the form of a histogram. Similarly to the cycle time scatter plot, the prognosis comes in the form of percentiles. The chart will show you the results of the simulation and how likely you are to achieve a certain throughput level. Logically, with a greater number of finished tasks, the percentile of certainty will be dropping. For example, if the results range from 35 to 135 tasks, you will have more than 99 percent certainty that your team will put 35 Kanban cards in done and less than 1 percent chance for them to complete 135 assignments. When Can We Finish X Number of Tasks? Forecasting when can you expect a specific number of tasks to be completed is of no lesser importance in Lean management. As mentioned earlier, the simulation can be run to show you precisely this kind of data. The mechanism is the same, but instead of showing you how many work items you are to expect by a date of your choice, here the simulation tells you how fast you are likely to finish a specific number of tasks on your Kanban board. This can be especially useful when you are running a portfolio Kanban, have already broken down your work into a precise number of tasks, and wish to know when can you realistically expect your team to be done with them. In conclusion, Monte Carlo simulations can be the light that you need in order to stop shooting blindly when committing to deadlines. Although they are complex and difficult to understand at the beginning, adopting Monte Carlo simulations can be a key to achieving continuous improvement.